“The Gold-Laden Sheep & the Sacred Mountain” is Ridham Janve’s directorial debut and it is one that has already impressed, winning the Silver Gateway of India at the Mumbai Film Festival, coming second in the India Gold Competition. It was written and produced by Ridham Janve and Akshay Singh. An elderly and curmudgeonly Gaddi shepherd Arjun Puhal herds his flock high in the Indian Himalayas, helped by his servant Bahadur. The old shepherd is constantly complaining about aches and pains while continually berating his helper as they look after the herds of sheep and goats in the isolated mountains. One day, they hear a boom and Bahadur speculates that it is a plane crash, and he recounts a time when several years ago, someone was able to salvage silver and gold from a plane’s wreckage. Meeting up with other shepherds one night, they discuss the folklore surrounding the sacred mountain, and how the fate of those venturing there is determined by the Naag god. Not long after, Arjun treks to a trading post to buy some supplies and hears from the shopkeeper that there are officials searching for the plane. The shopkeeper explains that there is a substantial reward, and a shepherd like him would be the ideal guide and offers to put Arjun in touch with the authorities who are looking for the wreckage. Arjun, having returned to camp, asks Bahadur to look after the flocks, while he sets out to the sacred mountain, without telling his servant where he is going. Soon afterwards, Bahadur tries following his master, but falls and injures himself badly. Meanwhile another team of men, keen to find the plane and receive a share of the bounty, go looking in the mountains. After starting to give up hope of finding the plane, they find the injured Bahadur, and carry him off the mountain. Meanwhile Arjun’s flocks are left to fend for themselves, and quickly start to succumb to predators and dysentery. Janve directs an amateur cast drawn from the Gaddi shepherd community, in a film which conveys the raw and uncompromising environment in which they live. The pace is slow, but measured, in a way that lets the viewer drink in the sights and sounds conveyed by the wonderful cinematography. In this regard, it recalls the golden era of Westerns in terms of its tempo and the use of expansive landscapes. Although the plot is easy to follow, this movie eschews a more formulaic approach to film-making, and instead showcases the potential of the medium as a powerful art-form. Many themes are explored in the film, including the moral decrepitude of the old shepherd who calls himself a ‘sadhu’ at one stage but who hides wine from his servant and (presumably) goes to the sacred mountain in search of bounty. Although the film has a modern setting, it shows men living close to nature, largely unaided by technology. There are allegorical elements in the movie, including the way the flocks of goats and sheep are left to perish as they are abandoned by the shepherd and his servant. as they are led astray by their own moral shortcomings. The film evokes a sense of the sublime on the sacred mountain, as Arjun encounters nature in its purest form, the god Naag, or indeed a final moment of self-reckoning. That the movie is open to interpretation, or leaves the viewer wondering, is a testament to its art. The use of Gaddi shepherds rather than trained actors only enhances the film’s authenticity and pseudo-documentary feel, and one gets the feeling that the filmmakers have as much captured as directed the performances of Arjun (played by Arjun Pant), Bahadur (played by Lokendra Gurung) and the supporting cast. Although this can probably equally be ascribed to Bigyna Dahal and Shijn Melvin Hutton’s sound and dialogue editing. 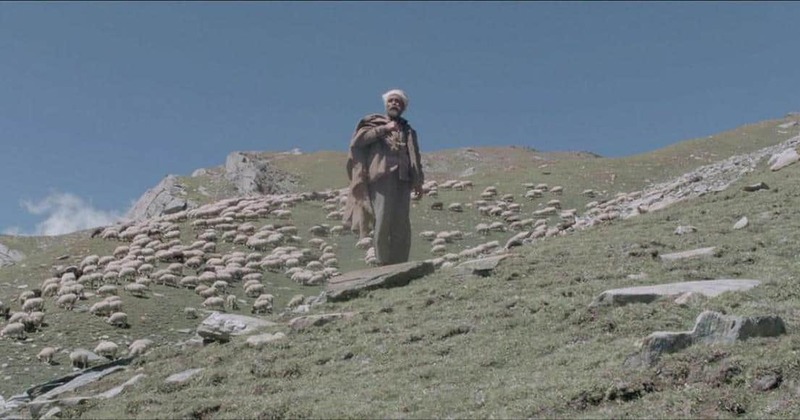 Saurabh Monga’s powerful cinematography is a strong-point of “The Gold-Laden Sheep”. Long, slow shots of the mountains with the characters moving across them transport the viewer there and convey the sense of harsh wilderness and expansive landscape. One gets the impression that this movie has been shot in remote locations under difficult conditions, but rather than being a hindrance, Kratika Adhikari’s skilful editing and Bhusam Kiran’s work as colorist creates a powerful aesthetic from the footage. Jered Sorkin’s score is subtle but suitable, never encroaching upon the sounds of nature captured by Bigyna Dahal , which are used to great effect to compliment the stunning visuals. “The Gold-Laden Sheep & the Sacred Mountain” is a masterpiece of modern cinema, and really showcases how an aesthetic approach to filmmaking can reap great rewards. I was once again reminded what a powerful art-form film can be, and the impact it can have on the viewer, as I continued to think about it the next day whilst out walking, and I can’t wait to watch it again. Some may struggle to find meaning in the film, and those who aren’t too fond of unanswered questions and loose ends might feel a bit disappointed, but I think the way certain aspects are left open to interpretation is part of its overall potency. A modern classic, and highly recommended.